The incredible story of the crocodile that crashed a plane is quickly becoming a piece of aviation folklore. The details have been published in mainstream newspapers all over the world and is now listed under incredible accidents on otherwise respectable aviation websites. There’s only one problem: there’s no official reason to believe it ever happened. Let’s start by looking at the crash. On August 25th in 2010, a Filair flight flying from Kinshasa Ndolo crashed into a house while attempting to land at Bandundu. The aircraft, a Let L-410, is a Czech turboprop which is a popular small passenger aircraft. The Captain was Danny Philemotte, the Belgian owner of the airline. The First Officer was British pilot Chris Wilson. That day there were three crew members and sixteen passengers on the flight. They were flying into Bandundu but the aircraft executed a go-around – that is, they circled around to attempt the landing again. On the second attempt, something went terribly wrong. Apparently after the aircraft went around, it turned and then crashed. A witness on the ground reported that it “fell out of the sky like a leaf” while in its final descent. The aircraft crashed into an empty mud-and-brick house about 2 kilometres (1¼ miles) from the airport. No one on the ground was hurt. The crew and fourteen passengers were dead on impact. Two passengers survived the initial crash but one died soon afterwards in hospital. Initially, Radio Okapi reported that the turboprop ran out of fuel as a result of breaking off the first approach. However, 150 litres of “kerosene” were recovered from the wreckage, so although a fuel malfunction is possible, the aircraft had more than enough fuel to continue the flight. Two days later, the surviving passenger gave an unclear statement about the moments leading up to the crash. She was still in critical condition but made a statement, in which she said that the passengers panicked and stampeded the cockpit because the aircraft was landing at a reserve strip instead of runway 11/29. There’s no evidence of a reserve strip at that airfield that I can find, although it is poorly documented. More importantly, how would the passengers know? This is the only official statement collected from the surviving passenger. Normally there would be a full scale investigation into the crash but unfortunately, this doesn’t appear to have been the case. 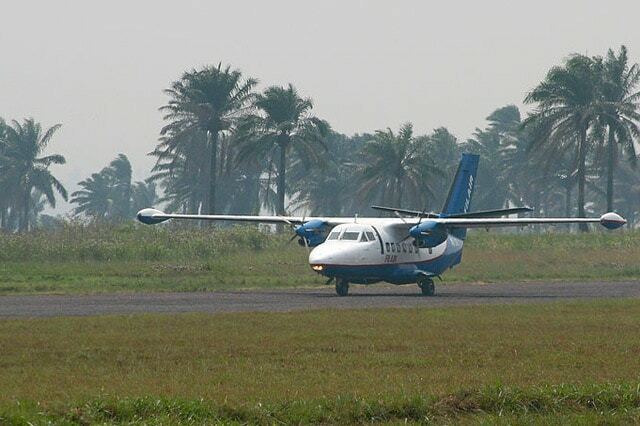 Part of this is the region: Filair and all airlines based in the Democratic Republic of the Congo are banned from flying in the European Union specifically because the DRC aviation authority does not maintain the regulatory oversight standards required by the European Union. It’s not particularly surprising that the investigation itself has not proceeded as one might hope. This mean that there’s not a lot of information about the crash and no real hope of ever getting more. The black boxes were recovered from the aircraft but no further information has been forthcoming. The British AAIB has asked for access to them but after four years, there seems little hope that the recordings or transcripts of their contents will ever be released. As a result, there’s a lot of speculation as to why a functional aircraft with 150 litres of fuel and competent pilots could just fall out of the sky. There is no further official information or investigation results regarding this crash. 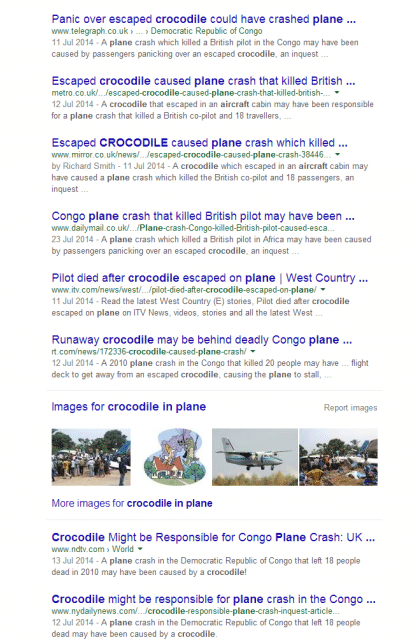 However, two months after the event, a Congolese tabloid ran with an astounding story: the plane crashed because there was a crocodile on board which panicked the passengers. The surviving passenger told Jeune Afrique how the crocodile had escaped from someone’s bag and caused the passengers to run for the cockpit. There was no clear explanation as to why the passengers might all decide on that course of action. [I] believe the newspaper who broke that story paid a lot of money for that story (and got what they wanted). The crocodile tale got picked up by various other tabloids with ever more witty headlines. The story was embellished with unverifiable details which were never part of the initial reports nor in the first article: the crocodile was illegal, hidden in a hold-all by a passenger hoping to smuggle it out for sale. 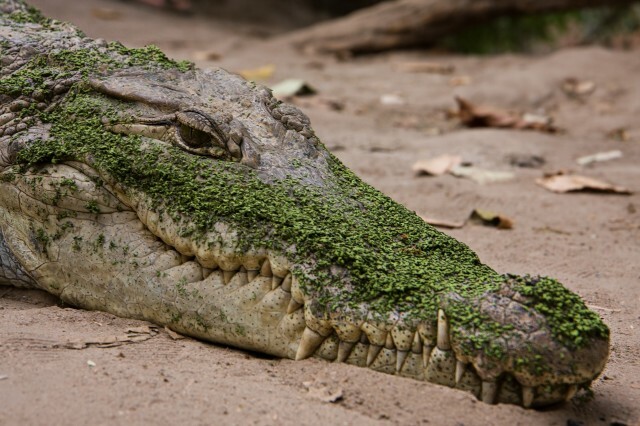 The crocodile escaped from the crash unharmed but one of the rescuers killed it with a machete. There was a video of the crocodile on YouTube (which has never been found). The crocodile scared the cabin crew member and it was she who ran to the cockpit in fear. No one in the aviation industry was able to find any means of verifying this tale and the Aviation Safety Network went so far as to ban any comments claiming the crocodile was the cause of the crash. The bizarre explanation was on the road to being forgotten. However, four years later, at the UK inquest of the British First Officer, the crocodile crash theory came into the public eye again. As a part of the inquest, the Assistant Coroner read out an email which was written by the First Officer’s father to the Congolese officials. In this email, the First Officer’s father said that there was this story he’d been told, that it was a crocodile who caused a panic and that the resulting weight shift may have caused the plane to go into a nose dive. That was enough for the mainstream press to run with the story. Again, there was no official statement, no follow-up to the initial article with any verifiable facts, nothing but a single tabloid piece claiming to have inside information from the only surviving passenger, with no reason given as to why she wouldn’t go to the police. And the scenario as explained at the inquest was not the result of any investigation, as implied by some media, but a single statement made by the grieving father about a story that he had been told. The inquest also heard that the aircraft might have been sabotaged by a rival company competing for business: an accusation which was equally lacking in any verifiable details. An air accident investigator at the inquest stated that he believed the aircraft stalled. This is one of the most common causes of a crash on approach, especially on a turn. However, it’s impossible to tell without more details of the accident. Timothy Atkinson, an air accident investigator, said he had reviewed the evidence given to him by Congolese authorities but was unable to draw any definitive conclusions because they were not handed over the black box. He said: “To date we have no information from the black box reader, it has been almost four years since the accident. “The aircraft struck a mud and brick building with a straw roof, and it came to a rest against another one on the ground. “The most likely explanation I can find is that the aircraft stalled and, or was in a spin prior to impact. “There is no evidence suggesting an engine failure, or a nose dive, although I cannot be sure without looking at the plane. “It would reinforce the idea that the accident appears to have the hallmarks of a stall and spin, which may have been from a variety of causes. The Assistant Coroner recorded an open conclusion, stating that there were only vague guesses as to what happened with this crash. Is it possible that the passengers stampeded the cockpit? It is, but I can find no other record of a plane crash caused by the passengers rushing to the front (or any other direction). If that is what happened, it’s technically possible that a crocodile was in the aircraft and caused the stampede. But realistically, I think this version of events are more to do with an irresistible headline than truth. “Fell out of the sky like a leaf” is how, according to the above article, the last moments of this flight have been described by an eyewitness. Some slightly incoherent and confusing stories have emerged. Like the mentioning of a “reserve strip”. It is not really likely that a passenger looking through the cabin windows can identify a “reserve strip”. Perhaps she saw a parallel taxiway ? The theory of a “stampede” towards the cockpit is not very believable, either. If the eyewitness correctly described the way the aircraft descended, then this would suggest a stall due to a sudden shift in c of g rearwards. I do not know the flying characteristics of the Let 410, but it is a 19 seat aircraft. It carried 14 so there might have been an additional load of cargo. Supposing there would have been enough space for the passengers to “stampede” to the cockpit, this could well have caused a dramatic change in centre of gravity, enough perhaps for the pilots to lose control. There is a major flaw in this theory: If this were the case, the aircraft would have pitched down and nose-dived into the ground. The debris pattern at the crash site would have confirmed this, had it happened. The aircraft carried cargo in the fuselage at the rear. During the go-around it slipped it’s lashes and shifted rearwards. The pilots were able to regain control. During the second approach – mind again, I do not know the flight characteristics of the Let 410 – the flaps were extended. With flaps extended, the aircraft became uncontrollable and entered a stall from which the pilots were unable to recover. Forget about the croc. It may or may not have been on board.